Review by AllTheBestFights.com: 2018-07-22, pretty good fight between Simphiwe Khonco and Toto Landero: it gets three stars. 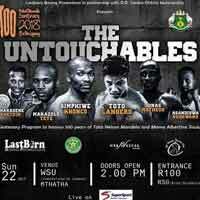 The Ibo champion Simphiwe Khonco entered this fight with a pro boxing record of 18-5-0 (7 knockouts) but he is not ranked as he hasn’t fought since June 10, 2017 when he defeated Lito Dante. Before this bout he had beat Nkosinathi Joyi and Siyabonga Siyo in 2016, while in 2015 he had lost to Hekkie Budler (Hekkie Budler vs Simphiwe Khonco). His opponent, Toto Landero, has a record of 10-2-2 (2 knockouts) and he entered as the No.13 minimumweight in the world but he comes off the loss against Knockout CP Freshmart (Knockout CP Freshmart vs Toto Landero); before this fight, in 2017, he had won over Vic Saludar and Powell Balaba. Khonco vs Landero is valid for the IBO World minimumweight title (Khonco’s third defense). Watch the video and rate this fight!